Here is another example of a very popular Passport Wedding Invitation which could also be customized as a Save the Date Invitation. The below example of a Passport Wedding Invitation/Save the Date is from Marsupials. We have done numerous passport wedding invitations using the Marsupials Line. We like their quality stock, craftsmanship and popular designs! 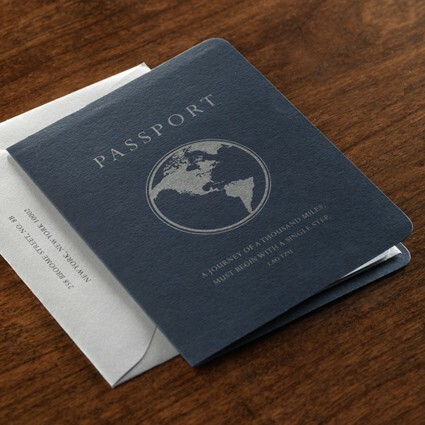 The above example of a destination wedding invitation is a Passport Wedding Invitation/Save the Date in Navy Blue with gold wording and world atlas logo. This wording and logo can be customized with your choice of design to suite your wedding and ceremony theme. The inserts of the card include the reception page perforated which can be torn and sent back to you for reservation. Couples love Passport Wedding Invitations for a Destination Wedding. 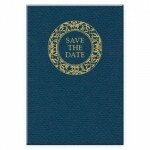 Our couples also choose to use this fun idea for Passport Save the Dates Cards. You can personalize the cover color for an extra fee and personalize this Passport Wedding Invitation with your names and event information. To see more options you can come in to our San Francisco store located at 3 Embarcadero Center where we can help you with a beautiful custom design. If you’re not in the San Francisco Bay Area, you can order on our Shop Online site where you can see more designs or see our wedding blog with lots of wedding inspiration. 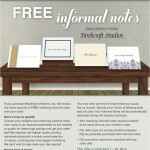 Another popular option is Digital Calligraphy to address your invitation envelopes. Please note: Our online and in store prices and options vary. Happy Planning!